Welcome to Electromatic Engineers Private LimitedManufacturer & Exporter of Electromagnetic ClutchesWe are an ISO 9001:2000 certified company, CE, TUV & NABCB certified company, founded in 1997 atUdaipaur with the brand name âUnitorqâ. High grade raw materials, Technically sound infrastructure & Cost effective range of products havehelped us to earn clientele across USA, UK, Germany & Singapore. Our product list includes Electromagnetic Clutches, Brakes & Torque Limiter Couplings. 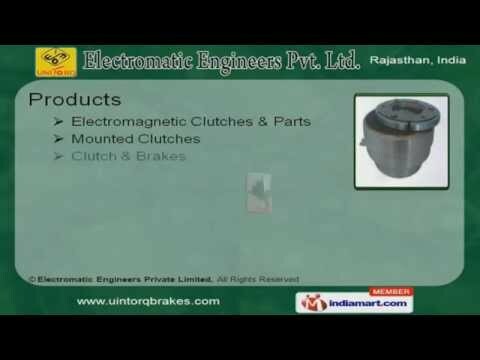 Electromagnetic Clutches & Parts are some of our best selling products. We offer premium grade Pneumatic Brakes, Torque Limiter Coupling & Limiters. Our Mounted Clutches are one of the best in the industry. We are specialized in offering Clutch & Brakes that are well known in the market for our impeccableperformance. Along with that we offer Torque Limiter Couplings that are one of the best in the industry.